Dear Guests, we’re now offering a special discount of 20% OFF on select rooms 4/1 – 11/15, 2019! 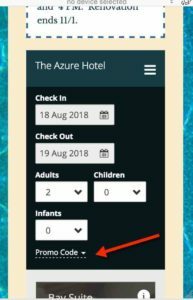 Just enter the promo code AZURE20OFF (see how-to) next to the date selector and make your Reservation. We are very pleased to welcome you to the Azure Hotel & Art Studio, a magical place to relax and rejuvenate in the idyllic water of the Caribbean Sea! The gorgeous beachfront is waiting for you, and so are we. – Michael, Fawnette & little Sky. “FANTASTIC BEACHSIDE ACCOMMODATION IN ST MAARTEN” – Just a few steps from the ocean, this hotel has a wonderful location. The rooms are well proportioned (we stayed in the Garden Suite and Saba Suite), and the property is well maintained. Michael and Fawnette, and all the staff, are very friendly, welcoming and helpful. “COULDN’T THINK OF A BETTER PLACE TO TURN 30!” – This was our first vacation to the island and it was more than I could have asked for. Mike and his family were the perfect hosts and the hotel common areas and our room were beautiful. We made an arrangement with Gigi’s organic restaurant to offer breakfast, lunch, and dinner at the Azure Hotel & Art Studio! Nice, yummy, delicious, ORGANIC! “BEST LITTLE SECRET ON THE ISLAND” – This was our first time staying on the Island, previously we had stopped by on a cruise, so we did not know what to expect. We found this little gem on Hotels.com and based on reviews decided to take a chance. WOW ARE WE GLAD WE DID! “AZURE..YOUR PRIVATE PLACE IN PARADISE!” – WOW- Just returned from a fabulous 4 night stay at the Azure Hotel + Art Studio. My husband and are avid travelers and are not ones to write reviews but felt compelled to express our memorable experience at this quaint hotel. “A BEAUTIFUL GETAWAY IN PARADISE!” – My wife and I stayed here on our summer vacation for 9-nights in July, 2014. Positives: The owner puts his heart into this hotel and it shows. The hotel was clean, and safe. Mike (owner) was always available to answer any questions we had and offer wonderful suggestions. “YOU’LL BE HAPPY YOU CHOSE THIS HOTEL!” – The two biggest reasons to stay here: 1: You can’t get closer to the beach without getting wet, and 2: The people who work here are the friendliest people I’ve met in any accommodation anywhere in the world. All quotes taken from the reviews of The Azure Hotel & Art Studio’s guests. We are proud to announce that The Azure Hotel became a five-time winner of the TripAdvisor® Certificate of Excellence which earned us The Hall of Fame Award, a remarkable vote of confidence to our business and our continued commitment to excellence. Check this out! Michael and Fawnette invite you to The Azure Hotel & Art Studio , a boutique hotel centered on the most beautiful beach in Sint Maarten. The Azure houses an art studio where they create original works of art (by appointment only). Located within a few minutes walk to all the action in Simpson Bay Village and nestled in a perfect piece of paradise, Azure is the place to be! The Azure Hotel is a proud winner of Certificate of Excellence! Many travelers on TripAdvisor chose The Azure Hotel as one of their favorites. Genuine public reviews help us improve our business. If you stayed at The Azure Hotel, feel free to make a mark and leave your feedback. Thank you. Get 20% OFF select rooms from April 15 through November 15, 2019! Use Promo Code AZURE20OFF. Don't feel like cooking or leaving the beach to eat? The Azure Hotel & Gigi's Organic Food restaurant are teaming up to offer breakfast, lunch, and dinner to our customers at the Azure. Copyright © 2019 . Azure Hotel & Art Studio, 6 Roberts Drive, Simpson Bay, Sint Maarten.